For more information, see: Microbiology. Microbial cell and population biology is the study of the cell biology of microorganisms, microbial interactions, signaling and evolutionary adaptations, multicellular-microorganisms and communities such as biofilms. Single-celled microorganisms generally exhibit two distinct modes of behavior. The first is the familiar free floating, or planktonic, form in which single cells float or swim independently in some liquid medium. The second is an attached state. Caulobacter crescentus is an example of a bacterium in which the planctonic and attached forms have distinctive differences in morphology, and this bacterium forms a stalk when it attaches to a surface, and when the attached cell divides it release a motile swarming cell which lacks a stalk. In other cases attachment depends on closely packed cells being firmly attached to each other and the solid surface by capsule and pilus structures. 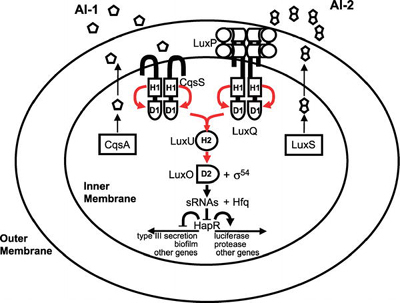 The change in behaviour after attachment is triggered by a quorum sensing signaling mechanism that varies among species. When a cell switches modes, it undergoes a phenotypic shift in behavior in which large suites of genes are up- and down- regulated. Although most microbes to not form specialized tissues like those found in plants and animals, they may, never-the-less, interact with one another and they have highly developed signaling systems to do this. Microbes can sense chemical signal from the same species and signals from different species . One form of interaction between different microbial species is formation of mixed communities on surfaces, or biofilms as they are called. In some cases microorganisms form true multicellular structures. The filamentous Streptomyces soil bacteria which form branching multicellular mycelia with aerial spore bearing filaments are one example. Another example with a very simple structure, consisting of just two types of cells filamentous cyanobacteria such as Anabaena species. The formation of complex structures such as multicellular spore body formation in Myxococcus is achieved by signaling between different cells at points of cell to cell contact  . Another well-studied example of intraspecies cooperation concerns the cyanobacterium Anabaena, which grows in long chains, in which approximately one cell out of ten differentiates into a heterocyst that provides fixed nitrogen for the neighboring cells (Figure 2, see top of page) . Dictyostelium is probably the most-studied model for cooperation among eukaryotic microorganisms, but even in the nonmotile eukaryote Saccharomyces cerevisiae, hyphal growth (that is, filamentous growth) can be viewed as a cooperative mechanism for foraging. Cooperation between different microorganism species is much less understood, or studied, partially for practical reasons, but also because the ubiquity of communication among microorganisms has only recently been appreciated. Nevertheless, it has been clear for many years that bacteria form biofilms on many surfaces (including human teeth, artificial joints, and organs, as well as on the surfaces and in the roots of plants, including crops) that consist of large consortia of different organisms. Moreover, it is clear that, far from being a case of pure Darwinian competition, interactions among these species and with eukaryotic hosts may be mutually beneficial. A recent case in point is the discovery of a mutualistic interaction of four bacterial species with the tomato plant (M. del Gallo, personal communication). Rather than competing, the four species coexist and strongly promote plant growth by fixing nitrogen, providing growth hormones, and preventing hostile bacterial species from growing. Tooth biofilms have been shown to consist of stable consortia of hundreds of distinct species, and bacterial mats are believed to consist of even larger numbers of species, in dynamic equilibrium among themselves, and with multiple bacterial viruses. Interest in bacterial cooperation has been spurred by the discovery that one of the autoinducers, named AI-2 (a furanone), is produced by a wide variety of bacteria, including most known human pathogens, and it may be one of a class of universal interspecies communication molecules  . These examples highlight the range of behaviors that could be termed “cooperation.” Cooperative behaviors include complex social interactions such as division of labor and mutualism in providing shelter, foraging, reproduction, and dispersal . The examples also highlight the importance of communication in adjusting group behavior to environmental circumstances and population density. Cooperation also has its discontents, and there is growing interest in the role and fate of “cheaters” among microorganisms. There is some evidence as well for “police,” particularly in the context of bacterial-host interactions, in which host systems favor the growth of symbiotic bacteria but discourage growth of noncooperative, but otherwise identical, cells  . For a recent review of communication in bacteria that highlights these issues, see . J. B. S. Haldane elucidated a fundamental principle underlying apparent altruistic behavior when he said that he would lay down his life to save two brothers or eight cousins, reflecting the one-half and one-eighth of his genes he shared with each, respectively. William D. Hamilton formalized these notions in his theory of kin selection, pointing out that the enhanced genetic relatedness of haplodiploid sisters, who share three-quarters of their genes, facilitates “altruism” in the haplodiploid species. Subsequent work has shown that kin selection can also work effectively under conditions of low relatedness and, furthermore, is not even necessary for cooperative behavior to arise. Cooperation can similarly be facilitated among unrelated individuals, for example, when the spatial range of interactions is restricted. Kin selection may play a role when limited spatial range is involved, but it is not essential . On the other hand, a limited range of spatial interactions is no guarantee of cooperation; it can just as well lead to spite and selfish behavior, as in the production of allelopathic substances in microorganisms and plants . For reviews of the selective mechanisms leading to cooperation and altruism, see   . Citation: Wingreen NS, Levin SA (2006) Cooperation among microorganisms. PLoS Biol 4(9): e299. DOI: 10.1371/journal.pbio.0040299 Published: September 12, 2006 Copyright: © 2006 Wingreen and Levin. This is an open-access article distributed under the terms of the Creative Commons Attribution License, which permits unrestricted use, distribution, and reproduction in any medium, provided the original author and source are credited. For more information, see: Quorum sensing. Cooperation between numerous different cells of the same species to initiate a specialized metabolic process that is triggered when a growing group of cells reach a particular cell density is seen for large range of activities. Examples include virulence factor secretion by several bacterial pathogens, and cell competence for DNA transformation and transition to sporulation by Bacillus subtilis. Such coordinated behaviour is usually achieved by secretion of autoinducer (alternatively called pheromones) molecules such as acyl homoserine lactone or small peptides and is called quorum sensing. Antibiotic formation, bioluminescence, ability to mate or exchange DNA, antibiotic formation by Streptomyces bacteria, and virulence factor secretion by pathogenic microbes are all example of cooperatively expressed microbial adaptations that are achieved using quorum sensing signals. A biofilm is a complex aggregation of microorganisms marked by the excretion of a protective and adhesive matrix. Biofilms are also often characterized by surface attachment, structural heterogeneity, genetic diversity, complex community interactions, and an extracellular matrix of polymeric substances. For more information, see: antibiotics. For more information, see: secondary metabolites. Not all interaction between microbes are cooperative, and antibiotic production by soil organisms such as Streptomycetes and colicin and bacteriocin production provide a good illustrations of this. But many other types of antagonistic compounds are secreted by microorganisms. Examples include immunosuppressive compounds like cyclosporin, and iron chelating siderophores whose function is to scavenge iron. The general term for these molecules is secondary metabolites. For more information, see: Streptomyces. Streptomycete bacteria are numerous in most soils and use a complex multicellular filamentous form which is a complex adaptation which allows them to be very successful in digesting soil polymers such as cellulose and chitin. In the soil hyphal filaments extend at the tips to penetrate solid matrices with the help of secreted enzymes, producing a soluble nutrients that are taken up by vegetative cells. As a colony ages changes in structure and new metabolic activities occur under the influence of chemical signaling circuits. The portion with access to air sends up long vertical filaments to produce hydrophobic spores, vegetative cells lyse to supply the aerial hyphae with nutrients, and pigments and antibiotics are produced. Antibiotics protect nutrients released from the lysed vegetative cells from being utilized by other bacteria. Studies of streptomycin antibiotic and sporulation by S. griseus revealed that sporulation and antibiotic formation are both controlled by a diffusible compound, A-factor, in a mechanism similar to quorum sensing..
↑ Shapiro, James; and Dworkin, Martin (1997). Bacteria as Multicellular Organisms, 1st ed.. Oxford, Oxford and New York. ISBN 0-19-509159-0. ↑ Crespi BJ The evolution of social behavior in microorganisms. Trends Ecol Evol 16:178–183 (2001). ↑ Shimkets, L. J. (1999) Intercellular signaling during fruiting-body development of Myxococcus xanthus. Annu Rev Microbiol 53:525–549. ↑ Kruse T et al. (2001) C-signal: a cell surface-associated morphogen that induces and co-ordinates multicellular fruiting body morphogenesis and sporulation in Myxococcus xanthus. Mol Microbiol 40:156–168. ↑ Waters CM, Bassler BL (2005) Quorum sensing: Cell-to cell communication in bacteria. Annu Rev Cell Dev Biol 21:319–346. ↑ Zhang CC et al. 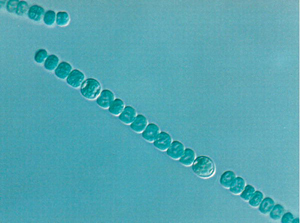 (2006) Heterocyst differentiation and pattern formation in cyanobacteria: A chorus of signals. Mol Microbiol 59:367–375. ↑ Crespi BJ (2001) The evolution of social behavior in microorganisms. Trends Ecol Evol 16:178–183. ↑ Kiers ET et al. (2003) Host sanctions and the legume-rhizobium mutualism. Nature 425: 78–81. ↑ Visick KL. et al. (2000) Vibrio fischeri lux genes play an important role in colonization and development of the host light organ. J Bacteriol 182:4578–4586. ↑ Keller L, Surette MG (2006) Communication in bacteria: An ecological and evolutionary perspective. Nat Rev Microbiol 4: 249–258. ↑ Durrett R, Levin SA (1994) The importance of being discrete (and spatial). Theor Popul Biol 46:363–394. ↑ Chao L, Levin BR (1981) Structured habitats and the evolution of anti-competitor toxins in bacteria. Proc Natl Acad Sci U S A 78: 6324–6328. ↑ Sachs JL et al. (2004) The evolution of cooperation. Quart Rev Biol 79: 135–160. ↑ Lehmann L, Keller L (2006) The evolution of cooperation and altruism. A general framework and a classification of models. J Evol Biol In press. ↑ West SA et al. (2006) Social evolution theory for microorganisms. Nat Rev Microbiol 4: 597–607. ↑ Hara O, and Beppu T (1982). Mutants blocked in streptomycin production in Streptomyces griseus: the role of A-factor. J. Antibiotics. 35:349-358. Crespi, BJ (2001) The evolution of social behavior in microorganisms. Trends Ecol Evol 16:178–183. Greenberg, EP (2003) Bacterial communication: tiny teamwork. Nature 424:134. Henke, JM & Bassler, BL (2004) Bacterial social engagements. Trends Cell Biol 14:648–656. Kolenbrander, PE et al. Genome–genome interactions: bacterial communities in initial dental plaque. (2005) Trends Microbiol 13:11–15 . Lyon, GJ Novick, RP (2004) Peptide signaling in Staphylococcus aureus and other Gram-positive bacteria. Peptides 25:1389–1403. Parsek, MR & Greenberg, EP (2005) Sociomicrobiology: the connections between quorum sensing and biofilms. Trends Microbiol 13:27–33. Shapiro, James; and Dworkin, Martin (1997). Bacteria as Multicellular Organisms, 1st ed.. Oxford, Oxford and New York. ISBN 0-19-509159-0. This page was last modified 15:08, 2 April 2009.